This paper utilizes a statistical approach, the response surface optimization methodology, to determine the optimum conditions for the Acid Black 172 dye removal efficiency from aqueous solution by electrocoagulation. The experimental parameters investigated were initial pH: 4–10; initial dye concentration: 0–600 mg/L; applied current: 0.5-3.5 A and reaction time: 3–15 min. These parameters were changed at five levels according to the central composite design to evaluate their effects on decolorization through analysis of variance. High R2 value of 94.48% shows a high correlation between the experimental and predicted values and expresses that the second-order regression model is acceptable for Acid Black 172 dye removal efficiency. It was also found that some interactions and squares influenced the electrocoagulation performance as well as the selected parameters. Optimum dye removal efficiency of 90.4% was observed experimentally at initial pH of 7, initial dye concentration of 300 mg/L, applied current of 2 A and reaction time of 9.16 min, which is close to model predicted (90%) result. Effluents from industries, such as textile, leather, plastics, paper, food and cosmetics contain many coloring substances, which can be toxic, carcinogenic and mutagenic [1–3]. In addition, some synthetic dyes cause allergy and skin irritation . The dye-containing wastewater, are not only aesthetic pollutants, but also may prevent light penetration in water, and thereby damage water sources and ecosystem [5–7]. Response surface methodology (RSM) is a collection of mathematical and statistical techniques for modeling and analysis of problems in which a response of interest is influenced by set of independent variables [14, 15]. Main advantages of optimization by RSM to conventional method are reduction of experimental trials in providing sufficient information for statistically valid results and evaluation of the relative significance of parameters and their interactions [16, 17]. In recent years, the area of optimization dye removal efficiency by electrocoagulation has received enormous attentions [6, 18–20]. However, according to our knowledge, application of RSM design in decolorization by EC rarely presented in scientific papers [21–24]. On the other hand, up to now there is no research available on treatment of diazo and metal-complex Acid Black 172 dye in aqueous media except by biological procedures. The aim of the present study was to optimize Acid Black 172 dye removal from aqueous solution by electrocoagulation process using RSM. For this purpose, central composite design (CCD) was used to develop a mathematical correlation between Acid Black 172 dye removal efficiency and four selected independent parameters including initial pH, initial dye concentration, applied current and reaction time. Synthetic wastewater was prepared by dissolving Acid Black 172 which was provided by Alvan Sabet Company (Iran) in distilled water. The general properties and chemical structure of the selected dye is presented in Figure 1. A plexiglass cell with effective volume of 2.5 liters and four aluminum plates with total effective area of 240 cm2 were used; the thicknesses of aluminum plates were 3 mm and the distances between electrodes was kept constant at 3 cm. Electrodes were connected to a DC power supply (Micro, PW4053R, 0-5A, 0–40 V) in a monopolar mode. For preparing a mixed solution in EC cell, a magnetic stirrer (Velp, Scientifica, Italy) was used. The Chemical structure and characteristics of C. I. 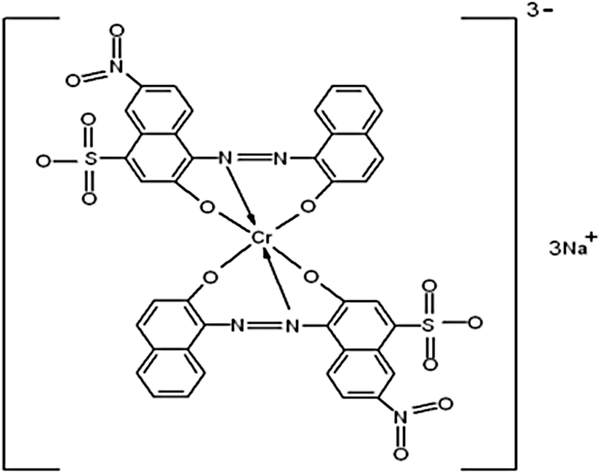 Acid Black 172 (molecular formula: C 40 H 20 CrN 6 Na 3 O 14 S 2 ; λ max : 572 nm ; molecular weight: 993. 71 g/mol). For preparation of stock solutions of the synthetic wastewater, Acid Black 172 dye as dissolved in deionized water and then diluted to obtain the desired concentrations. Sodium chloride (NaCl) was used to increase the conductivity of the solutions containing Acid Black 172 as the supporting electrolyte. The solution initial pH was adjusted before experiments by NaOH and H2SO4 and controlled using pH meter (340i, WTW, Germany). All the experiments were performed at room temperature. A total of 30 samples were taken from the cell at the end of experiments and centrifuged by a centrifuge device (Hettich, EBA 21, USA) at 5000 rpm for 5 min and then analyzed. Dye concentration was measured at a wavelength corresponding to the maximum absorbance (λmax) by UV-visible spectrophotometer (HACH, DR4000, USA). and xi, xj are the coded values of the parameters. The statistical software “Minitab”, version 15.1.1.0 was used for the regression and graphical analyses of the experimental data obtained. The accuracy of the fitted model was justified through analysis of variance (ANOVA) and the coefficient of R2. Estimated P values of the parameters for Acid Black 172 removal efficiency (%) are illustrated in Figure 2. As depicted in Figure 2, the amounts of P (P = 0.00) for all independent parameters confirms that four selected factors are significant. However, it was found that all square and interaction terms except x1 2, x2 2, x1x2, x1x3, x1x4 and x3x4 (P ≥ 0.05) were significant to the response. The analysis of variance (ANOVA) for the Acid Black 172 dye removal efficiency is given in Table 3, According to this table, the P value of 0 (P ≤ 0.05) justifies the reliability of the fitted polynomial model through ANOVA with 95% confidence level. Furthermore, parity plot for the experimental and predicted value of Acid Black 172 removal efficiency (%) is demonstrated in Figure 3. High R2 value of 94.48% validates the statistical significance of the model for the selected dye removal. Estimated P values of the parameters for Acid Black 172 removal efficiency (%). Parity plot for the experimental and predicted value of Acid Black 172 removal efficiency (%). Note: R2 = 94.48%, R2 (adj) = 89.64%. In addition, normal probability and residuals versus fitted values plots for Acid Black 172 removal efficiency are illustrated in Figure 4. As seen in Figure 4(a), the normality assumption was relatively satisfied as the points in the plot form fairly straight line. The reliability of the model was also examined with the plot of residuals versus fits in Figure 4(b). As illustrated in this figure, no series of increasing or decreasing points, patterns such as increasing residuals with increasing fits and a predominance of positive or negative residuals should be found. As a result, Figure 4 shows that the model is adequate to describe Acid Black 172 removal efficiency by response surface methodology. (a) Normal probability plot and (b) residual versus fit plot for Acid Black 172 removal efficiency (%). The main effect of each parameter on the Acid Black 172 removal efficiency is shown in Figure 5. For a better explanation, 3D plots are also presented in Figure 6. 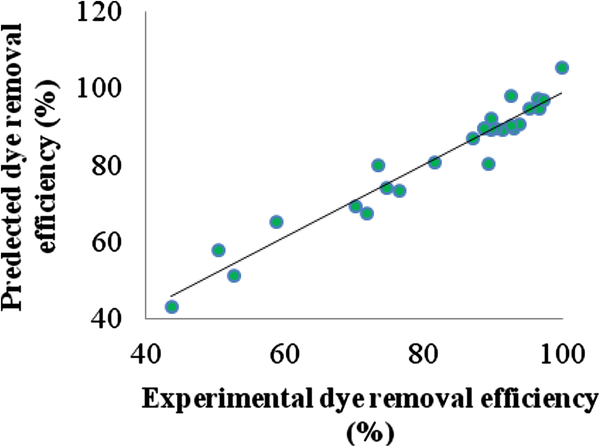 As illustrated in Figure 5, by decreasing in initial pH and initial dye concentration, and increasing in applied current and reaction time, dye removal efficiency improved. For instance, Acid Black 172 removal efficiencies decreased from 96.6% to 73.4% with the increase in initial pH from 4 to 10, respectively. In this investigation, according to Figure 5(a), best performances of EC system for dye removal were obtained at initial pH of 4. 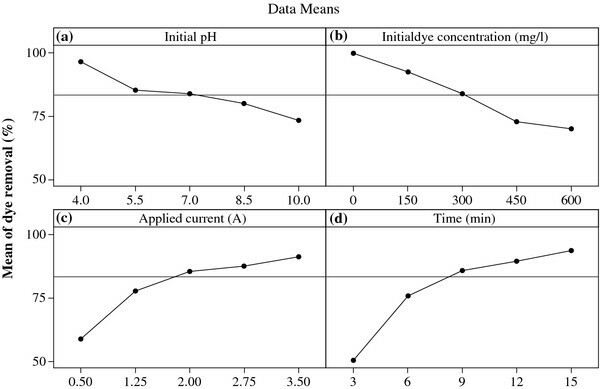 Main effect plots of parameters for Acid Black 172 removal efficiency: (a) initial pH, (b) initial dye concentration, (c) applied current and (d) reaction time. 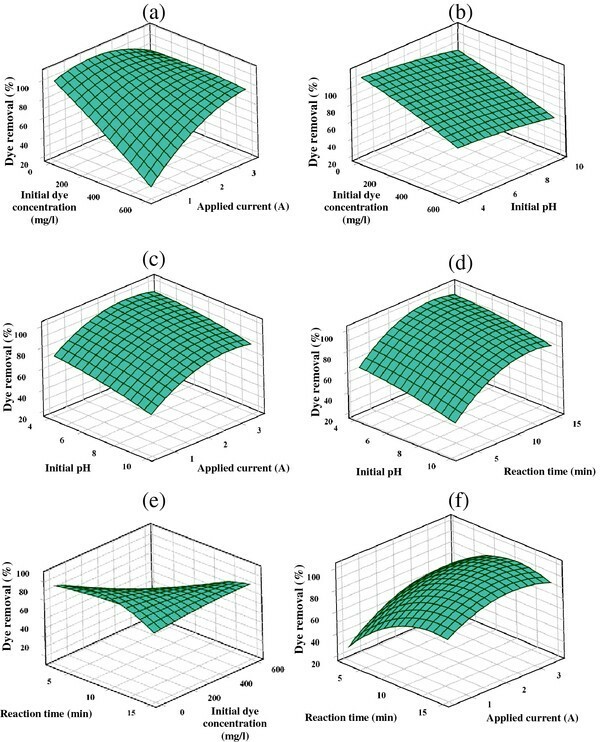 Surface plots as a function of: (a) initial dye concentration and applied current; (b) initial dye concentration and initial pH; (c) initial pH and applied current (d) initial pH and reaction time; (e) reaction time and initial dye concentration; (f) reaction time and applied current. Hold values: (initial pH =7, initial dye concentration =300 mg/L, applied current =2 A, and reaction time = 9 min). In order to determine the optimum point by electrocoagulation process, the desired objective in terms of Acid Black 172 removal efficiency was defined as target to achieve 90% removal efficiency. Table 4 shows the optimum values for Acid Black 172 removal from aqueous solution. The first row of this table is optimal conditions without any starting value. The optimum points from second to fifth rows in Table 4 was obtained with consideration of 4, 0.5 A and 3 min, as starting values for initial pH, applied current and reaction time, respectively. The initial dye concentrations of 150, 300, 450 and 600 mg/L were selected for second, third, fourth and fifth rows as starting values, correspondingly. As reported in Table 4, the experimental dye removal efficiencies and RSM predictions are in close agreement. where Ct, Co, and k are dye concentrations at any time t, initial dye concentration, and kinetic constant, respectively. Plots of (1/Ct-1/C0) with time are shown in Figure 7(b) for various initial dye concentrations (from 50 to 600 mg/L), at initial pH of 7 and applied current of 2 A. As demonstrated in this figure, reaction rate follows second order kinetic and its values increases from 0.001/min to 0.041/min when initial dye concentration decreased from 600 to 50 mg/L in the solutions, respectively. (a) Variation of Acid Black 172 concentrations with time; (b) determination of the kinetic constants for Acid Black 172 removal (initial pH of 7 and applied current of 2 A). According to the obtained results, the most and the least important independent parameters were initial dye concentration and initial pH, respectively. Similar to our results, Aleboyeh et al. , Alinsafi et al. and Arslan-Alaton et al. study groups reported that initial pH was the least important parameter in comparison with the other variables. In addition, Durango-Usuga et al. and Srivastava et al. expressed that initial dye concentration is one of the most important factors in decolorization optimization respectively by Factorial and Taguchi designs, which is similar to our results. Percentages of dyes removal in treatment by electrocoagulation process under optimized conditions through design of experiment methods (RSM, Taguchi and Factorial designs) are compared in Table 5. Present study shows 90.4% Acid Black 172 removal efficiency using electrocoagulation process through RSM at optimum point. As reported in Table 5, Alinsafi et al. and Yildiz  achieved over 90% dyes removal efficiency at much higher reaction time and lower current density, respectively in comparison with the present study. * Independent parameters in present study under investigations optimal conditions. Many Researchers have examined the impact of different parameters including initial pH, initial dye concentration, current density and reaction time on the dye removal efficiency in complex electrocoagulation process. Some study groups showed that the increase in current density and reaction time and the decrease in initial dye concentration improved the decolorization efficiency [6, 19, 22, 28], which is similar to our results. However, optimum initial pH reported for different types of anionic dyes removal in electrocoagulation process was different. For example, optimum initial pH was reported 7, 5–9 and 4–6.5 by Aleboyeh et al. , Aoudj et al. and Basiri Parsa et al. study groups, respectively. Lower optimum initial pHs were also obtained by other researchers [26, 27, 29]. According to our knowledge, up to now there is no research available on treatment of Acid Black 172 in aqueous media by electrocoagulation procedure. Therefore, the observed data from our results have been compared with the other treatment methods of Acid Black 172. For instance, Du research group obtained 86% Acid Black 172 removal by Pseudomonas sp. DY1 at their optimum conditions through response surface methodology , which is close to our results. According to the results of this investigation, RSM is a powerful statistical optimization tool for Acid Black 172 removal using electrocoagulation process. The RSM results revealed that four selected parameters as well as some of their squares and interactions influenced the electrocoagulation performance. High R2 value of 94.48% through ANOVA, verified that the accuracy of the Minitab proposed polynomial model is acceptable. The optimum Acid Black 172 removal efficiency were found at initial pH of 7, initial dye concentration of 300 mg/l, applied current of 2 A and reaction time of 9.16 min. An experiment was performed in optimum conditions which confirmed that the model and experimental results are in close agreement (90.4% compared to 90% for the model). The authors are grateful to the Amirkabir University of Technology (AUT) research fund for the financial support. In addition, the authors wish to express thanks to Mr. Masoud Asadi Habib and Mr. Mohsen Behbahani (former MSc students of Amirkabir University of Technology), and Ms. Lida Ezzedinloo for their assistance during experiments. The authors also declare that they have no competing interests.